By 1830 Puerto Rico born Grogorio Irizarry Rodriguez ( -1876) had inherited several acres of land spread between contiguous Barrio Sierra Baja of Guayanilla and Barrio Sierra Alta of Yauco in which he had some minor agricultural activity. Ca. 1838 Gregorio acquired from Juan Ramón and Juan Matias Caraballo 1,052 cuerdas in Barrio Guilarte and Barrio Limani of Adjuntas which he leased to several coffee planters. These 1,052 cuerdas were sold in 1877 to Corsican immigrant Domingo Mariani Dominicci (1816-1902) who arrived in Puerto Rico in 1846 and who at one time was also owner of Hacienda Santa Clara . Under Domingo and his nephews Tomás (1835-1918) and Antonio Santiago Pietri Mariani who arrived on the island in 1858, the property came to be known as the very prosperous Hacienda Esperanza, named in honor of Antonio Santiago's wife and cousin Esperanza Mariani Pietri whom he married April 22, 1887 or maybe the daughter of Tomás and his wife and cousin Micaela Mariani Román's Esperanza Pietri Mariani, born in 1866. Eventually Antonio Santiago sold his interest in Hacienda La Esperanza to his brother and moved to Yauco where he established a coffe exporting business. In 1852 Gregorio and his wife Maria de Jesús Irizarry Oliveras established Hacienda Fortuna as a 160 acre coffee plantation. Upon Gregorio's death in 1876, Fortuna was inherited by his daughter Maria Concepción Irizarry Irizarry who in 1872 had married Corsican immigrant Francisco Mattei Bonavita (1837-1911). Francisco's brothers Juan Bautista and Antonio Mattei Bonavita owned Hacienda San Rafael, a sugar plantation in Yauco. Having the required capital from the sale of the land in Adjuntas and with knowledge in the sugar business gained from his brothers, in 1878 Francisco installed an oxen driven mill to produce muscovado sugar and molasses for rum. In 1911, upon the death of Francisco Mattei Bonavita, his son José Maria Mattei Irizarry (1877-1969) became the administrator of Hacienda Fortuna. In 1916 given the increase in sugar prices that would lead to the famous "dance of the millions" in the early 20's, modern machinery was installed at Fortuna to increase production and efficiency. Even then Fortuna was not a big producer of sugar, based on production for the years 1917 to 1922, total production was 60,438 pounds of sugar or an annual avarage of 5 tons. In 1917 it produced 52 barrels of molasses. 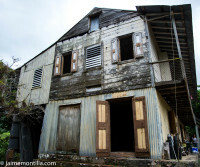 Hacienda Fortuna was the last sugar hacienda to cease operations on the island, having produced sugar until 1937, way after the hacienda concept vanished with the advent of Central Sugar Mills at the turn of the century. It continued to produce coffee until 1969, the year Jose Maria passed away. Hacienda Fortuna was then inherited by his son Edwin José Mattei Irizarry, it never again operated as a plantation. Hacienda Fortuna has the peculiarity of being one of the very few haciendas in Puerto Rico that produced sugar as well as coffee and today has remains related to both. It is located in Barrio Sierra Baja off of PR-375. Today the remaining Manor, machinerry and milling houses are in a 1 acre property, an adjacent 40 acre tract of land still belongs to the family but is not being cultivated. Old pictures of Hacienda Fortuna below are made available with permission and the courtesy of Archeologist Luis Pumarada O'Neill.